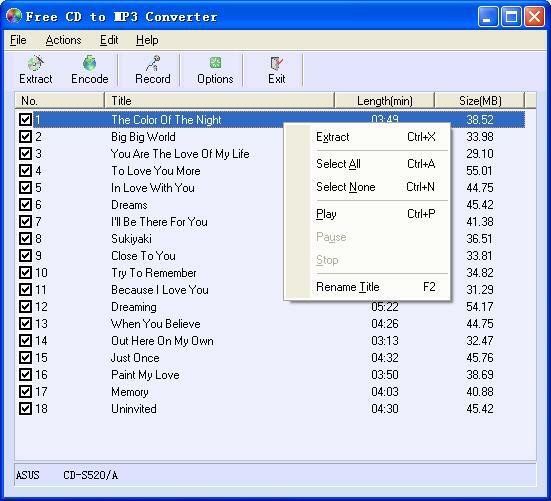 Free cd to mp3 converter: A free and easy to use mp3 converter software. Free CD to MP3 Converter is an easy-to-use free CD ripper software that allows you to extract audio files from a CD and convert them to MP3, Wav, Ogg or Wma format. It can automatically retrieve title information from the CDDB database, normalize the output files and supports additional LAME options. You can also use the software to record to MP3 with your microphone, or to convert WAV files to MP3, Ogg or Wma format. Support ID3 tag edit. You can use it freely. Free CD to MP3 Converter used AKRip and LAME encoder. AKRip and LAME are licensed under GNU LIBRARY GENERAL PUBLIC LICENSE. You can select the track you want to rip and click Extract to start to extract. It's too easy. Eusing Software now invites you to become our volunteer UI translator to localize our popular Free CD to MP3 Converter into your language. The translation process is simple, easy and fast. Now we support the following languages: Arabic, Catalan, Chinese, Czech, Danish, English, French, German, Greek, Hungarian, Italian, Latvian, Nederlands, Portuguese, Russian, Slovenian, Spanish, Swedish, Turkish. Free CD to MP3 Converter is a freeware product, this means that you can download and use it for free. Anyway we will appreciate contributions: we will use collected money to finance new development of Free CD to MP3 Converter. Our other products: Eusing Free MP3 Cutter - Cut MP3, WAV, WMA files into pieces. Free WMA MP3 Converter - Audio converter for WMA, MP3 and WAV format.